Ok, I’ve been seriously lagging on the blog but mainly because of all kinds of projects Keri and I have going on around here. So I’m beginning anew. What has suffered more than Coffee Stains is my regular paper journaling habit. 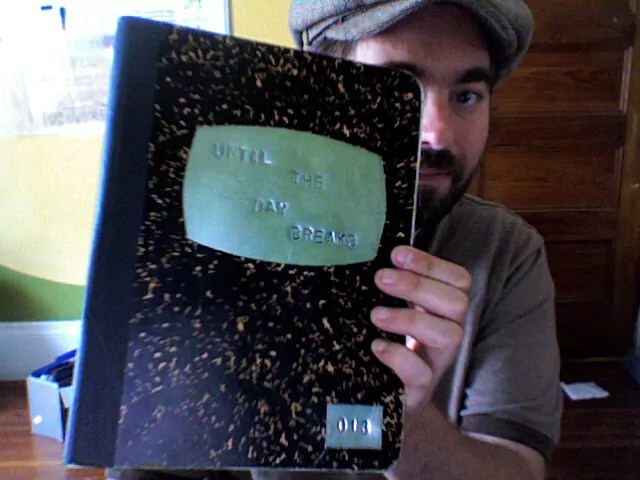 There was a time when I wrote daily in my paper journal but over the past couple years the entries have become sporadic and in my opinion just plain boring and lacking real substance. No more! I’m currently just a little over halfway through my current and twelfth paper journal. Visually this current journal (titled “As The Crow Flies”) is very cool. Here’s a picture of the cover. My problem with this journal is that the interior pages are lined as graphing paper. 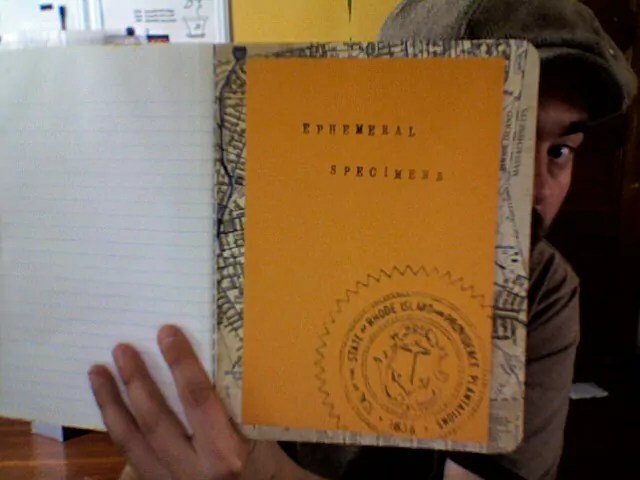 I thought it’d be a cool idea to try it out since all my others are plain old composition notebooks except for one completely line-free one that I just hated writing in. Turns out that the smaller line writing space in the graphed one just makes me feel like there’s too much space to fill. There isn’t, of course, but in my brain there’s just too much. So now I’ve been preparing my next journal using my old lined composition book formula that works well for me. I haven’t even written in it yet and I’m loving it. The title comes from a line of Song of Solomon, “Until the day breaks and the shadows flee, I will go to the mountain of myrrh and to the hill of incense.” This seems to be a common epitaph in the burial grounds here in New England. I decided to take a minimalist approach to the cover alteration. Normally I will completely redo the covers but I wanted this one to have an aged and ancient feel to it with a little bit of steampunk flavor. The title and journal number is die-stamped onto scrap printing tin and embedded between the layers of cardstock that make the cover. The tin was then inked completely in black permanent ink and then wirebrushed back to give it an antiqued look and so the lettering would stand out. The surface of the cover itself was stained with a caramel colored alcohol ink to give it a amber tint. 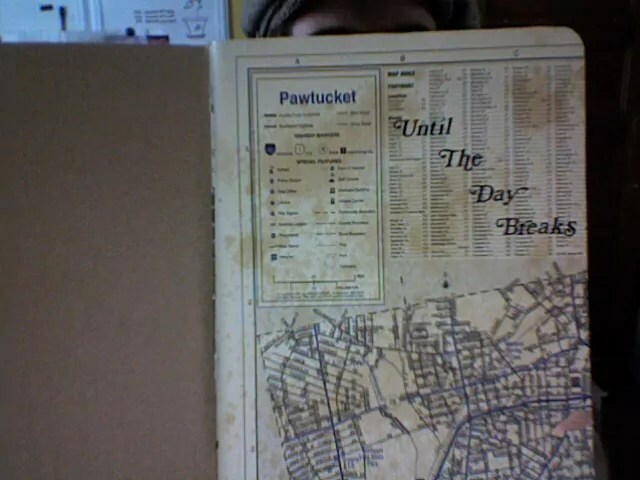 The title page within was made with a map of Pawtucket that I soaked in coffee and tea and then sprinkled with tea mix. The ephemera pocket in the back is a manila envelope with stamped lettering and an image transfer of the State seal of Rhode Island. 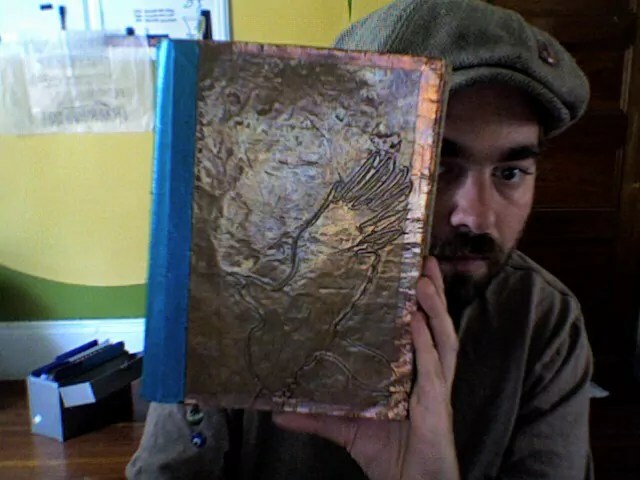 I’ve still more work to do on this so will post more pictures soon but here are some pictures of the journal design in progress.